Vanderbilt University is now providing an optional free tool called GradReady which includes information for managing tuition, budgets, and bills. When you click on the link above you will need to create an account. You will always maintain access to this tool as a student and after you leave Vanderbilt. 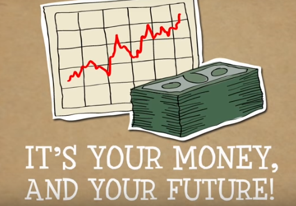 It is designed to help you understand your financial aid and manage your finances. Having a bank account is one of the simplest forms of managing your money. It is important to know the difference between the two main types of accounts you can open at a bank. 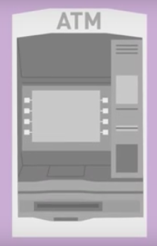 A checking account is an account designed for everyday transactions. A savings account however, is an account for money that is not meant to be spent but saved overtime. Some banks will charge a yearly fee for having an account. Also, some banks will charge a fee if you do not keep a minimum balance, especially in your savings account. It is best to find a bank that does not have fees. Banks can put a limit on the number of free transactions you can make from your savings to your checking with most being around 3 withdrawals a month before charging you a fee for a transfer. Consider finding one that does not charge a fee for transactions. With the rise in technology and mobile applications, banks created online banking for easier convenience. Also some banks even have mobile applications that you can download for banking on the go. One important thing to keep in mind is making sure you do not overdraft your account. Overdrafting means spending more money than is actually in your bank account. If this occurs you can be hit with a charge to your account. Most charges range around $35. The Department of Education offers many flexible repayment options that can best fit your financial need. Below are a couple of the different types of payments plans. You can go to www.studentaid.gov to get more information. 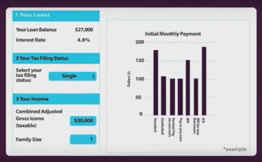 You can also visit their website to use their Repayment Calculator that can help you get an idea of what your payment would be for each of the different type of repayment options. With the growing amount of people using online resources to manage their banking, credit, investments, etc. identity is becoming more prevalent. Hackers are finding more ways to steal someone’s identity and finances. Below are some of the main ways that identity thieves can steal your information. You can learn more about these and ways to prevent identity theft by visiting the GradReady website. Phishing: this is an attempt to steal your personal information through email by pretending to be a trustworthy source. Pharming: this is where a hacker installs malicious code on a personal computer or server. This code then redirects clicks you make on a website to another fraudulent website without your knowledge. Vishing: are attempts to get you to provide personal information over the phone. Smishing: this uses cell phone text messages to get you to provide personal information. If you are borrowing money of any type, it is important to understand your credit score and what makes up your credit score. A good credit score can allow you to buy a house or car, rent an apartment and even help you get better rates on insurance. 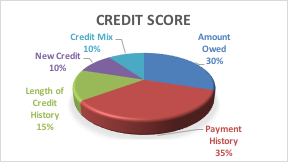 Below is a chart of what components make up a credit score. The amount of money you envision making in the future should be your guide as to how much student loans you take out. You don’t want to take out more debt than you can afford to pay back once you graduate. GradReady’s Debt-O-Meter can help you determine the amount of debt you can afford to take out comparable to the job you are wanting in your future. Total Income: The full amount of take home income from any/all sources, also referred to as ‘net’ income, not to be confused with ‘gross’ income which is income before taxes and other deductions. Discretionary Income: Income remaining after all taxes, mandatory charges, and all necessities such as food, shelter, and clothing are paid. Money that is left for spending on nonessentials and lifestyle choices. Also referred to as ‘disposable’ income. Fixed Expenses: Expenses that stay about the same from month to month. Examples can include categories such as rent, car payment, insurance, debt payments, membership fees, etc. Variable Expenses: Expenses that vary from month to month. Usually are controllable costs. Examples can include categories such as utilities, groceries, eating out, entertainment, and/or clothing. Determine your total income (make sure you are using net not gross amounts). Include any jobs, anticipated refunds, and meet with family to determine their level of anticipated support. Determine all expenses. One way to do this is to track all your expenses for a week or a month. You can do this by looking at your banking statements or using an app or online spending tracker. Categorize expenses. Differentiate between wants and necessitates. Prioritize necessitates when creating your budget. Different categories of expenses could include: housing, food, transportation, education, entertainment, cell phone, clothing, etc. Make sure the budget balances. Make sure you are not exceeding your total income. Total income – total expenses should = $0 or a positive leftover balance. If the balance is negative see if you can cut things that fall into the ‘want’ category or pick up additional income. Make sure to budget for savings. This is the best way to be prepared for emergencies and avoid having to rely on costly credit. Pay yourself first! Ideally your savings could cover 3-6 months of expenses. Remember to factor in non-regular expenses that may not show up every month. Expenses like books and other school supplies may not be needed on a consistent basis but only at certain times in the year. Make sure to factor these in as well. Revisit and adjust often! Budgeting in college is good practice for more complicated post-graduation income and expenses. Review regularly and update budget and savings goals. 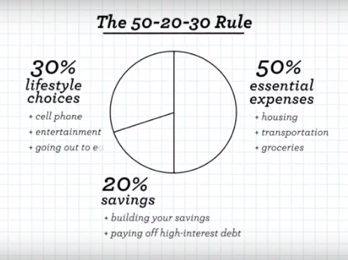 The 50/20/30 Rule: One good rule of thumb from financial experts. The first 50% of your budget is geared toward necessities. The next 20% goes to savings or extra payments to reduce debt. The last 30% is for your wants. Use a budget to compare the costs of living on-campus (meal plan and housing) versus living off-campus. Remember to include new expenses you will have off-campus such as toilet paper, cleaning supplies, utilities, internet/cable, etc. Rent versus the on-campus housing charge will not tell the complete story. You can also use budgeting to spot the differences in costs between studying abroad and staying on-campus for a semester. Things to keep in mind would include the difference in travel costs (home to study abroad vs. home to Vanderbilt), transportation costs in that country (will you need to take a train/bus to class), exchange rates, and general cost of living. Entertainment is often a category that will bust college budgets. Wanting to hang out with friends does not have to be expensive though. Here are some ideas of free activities to take part in in and around Nashville! Stocks: Owning a piece of a company you buy stock in. Value of the stock will rise and fall until you decide to sell your stock. Shares: Stocks are bought and sold as shares, usually in a marketplace or exchange. Dividend: When the company produces a profit the shareholder receives a portion of that profit known as a dividend. Bonds: A loan to a company and/or the government, you get the money back over time plus interest. The loan had to be paid back in a certain time frame which is commonly known as the bond reaching maturity. Mutual Fund: Group of investments- generally of different types including stocks, bonds, etc. Real Estate: A common type of investing is with your home purchase or other real estate. The equity in the real estate is considered an asset. 401(k): A type of investment plan that is exempt from taxation until you remove the funds from the account. Some employers will match the amount you choose to contribute (usually with a max cap) to the account. This amount is generally deducted directly from your pay check. There is a penalty for withdrawing from the account before retirement. Individual Retirement Account (IRA): Similar to a traditional savings account but specifically for retirement with certain taxes breaks. There are quite a few different types of IRA including SEP, Simple and Conduit to name a few. The money is contributed to the account pre-tax and is taxed when it is removed from the account. Roth: A type of retirement account where the money set aside is contributed after taxes have already been assessed on it. Meaning that you pay no taxes when you withdraw from the account. Gross Pay: Amount of your income pre- taxes or any other withholdings. Net Pay: The actual amount of your take home income after taxes and any other pre-tax withholdings are removed. Year to Date (YTD): Amount of gross income received to date in the calendar year. This amount should be listed on your pay stub and can be valuable for tax purposes. Salary: What cash compensation is the organization offering? Pay Structure: Is the pay commission based where hours and pay could vary requiring you to have a more affluent savings account? Is the income fixed and if so is pay- weekly, bi-weekly, monthly, etc? Cost of Living: The cost of living expenses in different parts of the world and country. This is usually driven by the housing costs in different places. Your actual salary or hourly wage will not be equal to your take home pay. You are required to pay federal income tax and the majority of states have an additional state income tax. Social security and Medicare (FICA) are also withheld from paychecks by employers. You may also have the option of having other costs deducted from your paycheck such as health insurance, retirement fund contributions, parking, health or dependent care fund contributions, etc.